Thanks so much for all of your sweet comments about our living room plans! I am on cloud nine watching the designs beyond the reno start coming to life. I get so many questions about how I design a space and most of them are about how I choose items. How do I know they’re right? And that’s always hard to answer. For me, our spaces have to come together super fast. When you’re on an adventure of renovating and moving every two years (which will not last forever, but so far that’s our pattern), you don’t have six months to put together each room or nothing would ever be finished and it would never feel like home. I usually start by nailing down a whole house vision first. That usually includes some color, some finishes, maybe an item or two I KNOW I want to use. It’s the overall feeling. Then, I work out from there and design each space with that feeling in mind. While I can usually visualize a space in my head, I’ve had plenty of times where I get a light fixture or some detail in the room and it just isn’t right. So often, I wish you could actually see items in the space first before purchasing. That’s actually been a part of so many design questions I get, “How do you decide without seeing it in the space first? Or do you just get it to test it out and then return it?” I do not have time for all that hassle, as I know many of you don’t. The errands are as streamlined as possible these days…hauling two babies around town in between nap times is not my idea of fun. 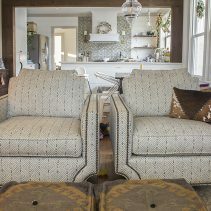 When I started planning this reno, I learned about a new feature with my favorite home brand, Wayfair, that literally solved this issue. And it was the biggest help to me in designing these spaces! Let’s start with the kitchen. These were the first room plans I shared. It was the first room that really came together in my mind and it immediately was my favorite room I’ve ever done…in my head of course at that point. First, let’s refresh the plans we’re going for in the kitchen since it’s been a little while. Even now, my heart starts to race when I look over that mood board. This was the perfect interpretation of that feeling I wanted this house to have from the overall design vision. And I’m dying to see it take shape! But there is a lot going on in here! An entire panel of patterned tile behind the hood, shiplap walls elsewhere, brass sconces, weathered sink pendant, vintage Persian rug….I immediately loved it all together, but did have this nagging feeling…am I crazy? Can all this really go together in the way I envision? In comes Wayfair’s new View in Room feature. Oh my gosh, y’all. This is such a game-changer when designing a space in your home! 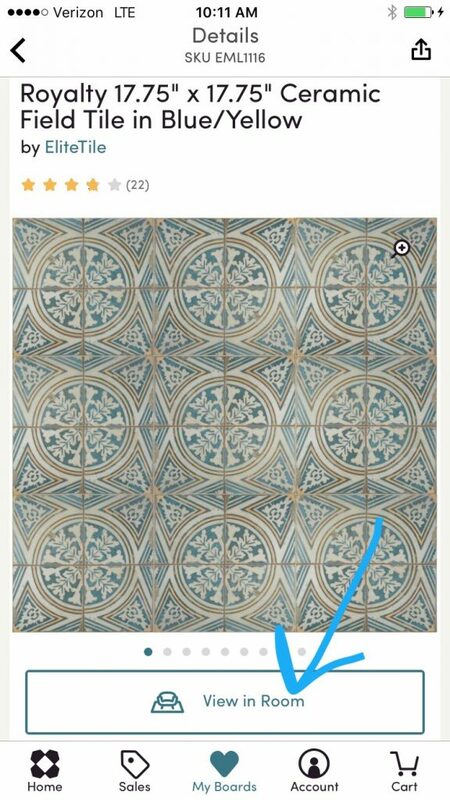 I always check Wayfair first anyway when looking for something for our house (huge variety, great prices), but this is even more incentive to. You can see almost every product literally in your room before you ever order! In the past when I couldn’t decide on items, I would take an image of the empty or in-progress room into Photoshop, save product images I was considering, cut them out using a Photoshop tool and then drag them onto the image to see. It took hours and hours. Now, you can have the same effect with a few quick clicks. When you click that button, an image of the product pulls up along with your camera. You can either take a photo then with the product image where you want it OR you can choose from your camera roll and layer the product over an existing image. You can drag, resize, etc. to get it where you want! You can save the images, share them with friends, and hang on to them to remember your design ideas! Alright, let’s take a look at how this worked out for our kitchen. 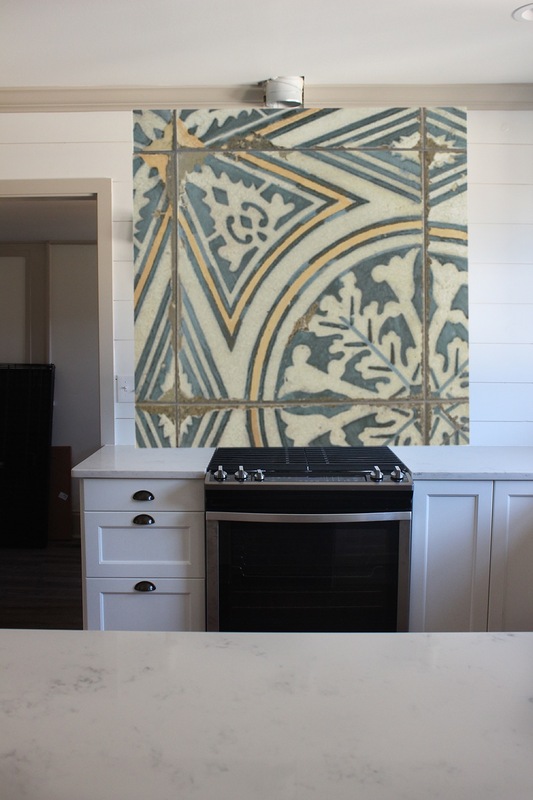 I had nailed down the kitchen design in my head long before the room was even gutted…but I was unsure about the tile and all of the elements working together. As soon as the kitchen was to a nearly finished, but still empty state, I pulled out the handy View in Room feature to make sure my choices worked before ordering them! We needed it functional, but the design details would come later. First, I tried out the tile. The program automatically chose this section of tile. Tile is difficult because of how it repeats. But I loved being able to see the colors and pattern with the trim color and this totally helped me view it as the focal point of the room. Then, I layered on the sconces. The tile with the brass sconces with the tinware mug and the large cutting board…exactly the quirky country vibe I was going for. Let’s take a look at the sink side of the room. 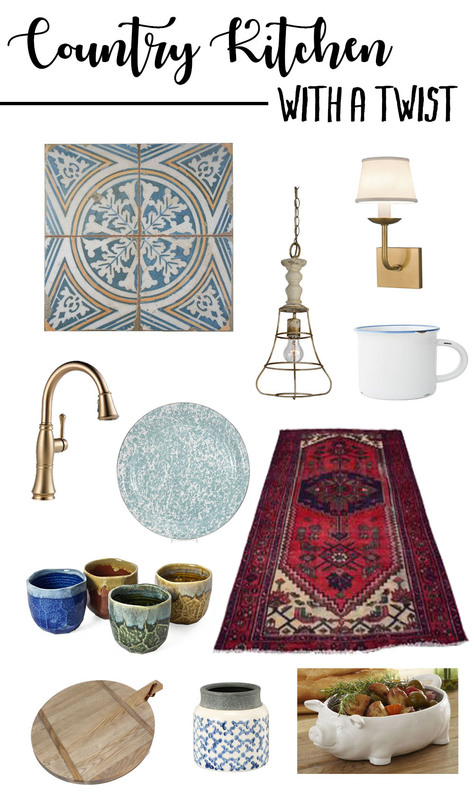 I tried out the above-sink pendant and these pottery teacups I desperately wanted to use in here. I love the country aged feel they bring. 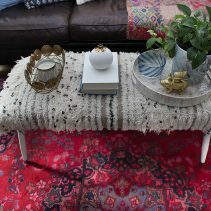 Oh my goodness, these pieces with that rug…I love it so much. I loved the patina of the light fixture with the cleaner brass faucet in my head, but you never know how that will read in person. This showed me they were perfect together, just as I’d hoped. This feature sold me on this kitchen design! It showed me that the design ideas in my head would be even better translated into the space. Can y’all see it coming together? This was also so helpful for choosing lighting in the living room! The first design idea I had for the living room was to do the white antler chandelier we’ve wanted for four houses now! But I wanted it to really pop, so I pictured it in front of the blue fireplace. And I wanted modern sconces to offset the rustic chandelier. YES, YES, AND YES. Exactly what I was imagining! I checked it out from the other view as well. 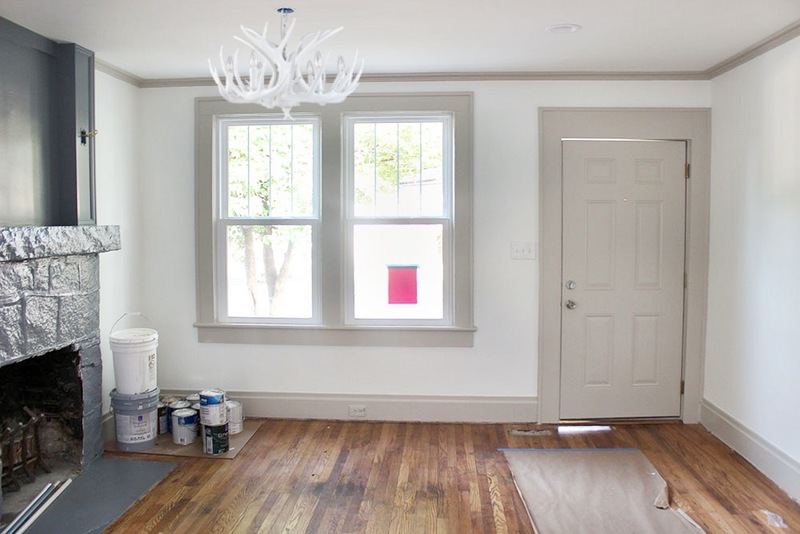 We knew we wanted a white antler chandelier – it was one of the first things we decided on for this house! But these images sold us for sure. If you haven’t already, make sure you download and try out the Wayfair app! View in Room is my new favorite design tool for sure. Later this week, I’m going to show progress on both of these rooms and you’ll actually be able to see a few of these things in place. It feels like it’s taken forever to start finishing rooms, though we only started whole-house, gut-job reno five months ago! But it feels like so much longer and I am so excited to see the design vision for this space come together. Oh, good to know. I love how the app seems easy to use and not complicated. Sometimes I don’t need to see an elaborate rendition, I just need to get a rough idea. This app seems great for that. I’ll have to try it out! I love Wayfair and have always had a good experience with them and their products. This App will take the guess work out of purchasing items for our home. Thanks for sharing Lindsay! 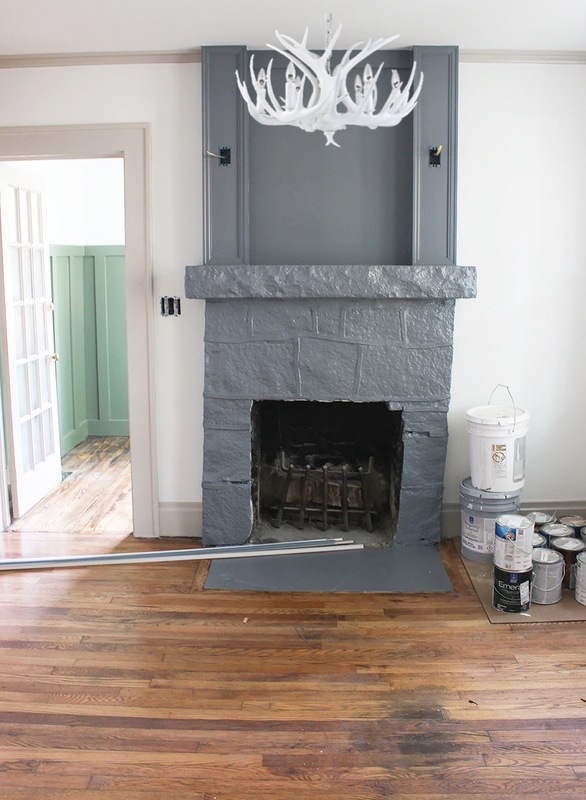 As always, I’m excited to see how your house reno comes together. You make downsizing look like something I could handle. Blessings! Thanks so much, Kathy! Yes….Wayfair and this feature is amazing. And downsizing has actually been wonderful! We have loved it!!! This is dangerous information to have. 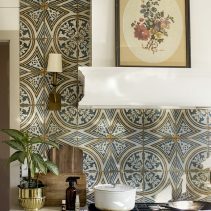 That feature is so cool & I imagine addictive when in the thick of a reno!!! Who’d ya’ll end up going with for cabinets? They look great! Thanks so much, Morgann!!! 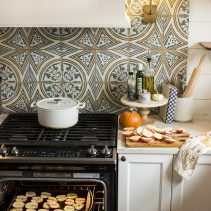 We love the tile so much. 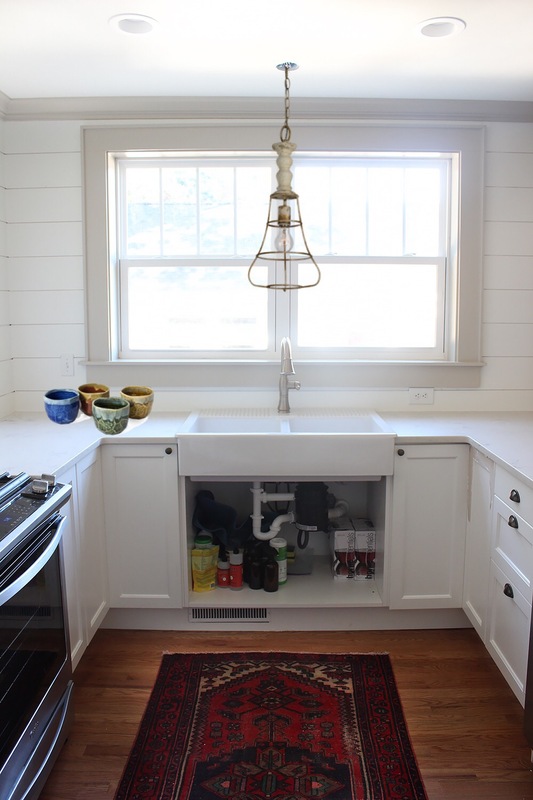 So I’ve got a post about the cabinets coming up…love what we did on these! We actually did IKEA bases, but then had a local cabinet maker make custom wood doors! Ended up LESS than IKEA doors and look so much better!